The proper method of making a martini and the amount of dry vermouth to use in one is a long debated subject. Martinis are maybe the most personal of cocktails because there are few ingredients but numerous ways to prepare one. The most important thing in making a martini is that the final cocktail must be ice cold. Any weak stirring or shaking will result in a martini that is not cold enough and this is unacceptable. Run a martini glass under the faucet and put it in your freezer a few hours or the day before you think you might need a very strong drink. Pour a cap full of vermouth into your glass, swirl it around and dump it out - this will leave just a trace of vermouth in your glass. Fill your shaker or mixing glass with ice, add the gin, stir or shake it until its ice cold (100 shakes to be sure). Strain into your martini glass and garnish with olives or a lemon twist. In a silver julep cup, muddle 1 tsp of superfine sugar with a few fresh mint leaves, add 2 oz of Kentucky Straight Bourbon, top with crushed ice and a fresh mint sprig. Serve with a straw and wear a big hat while drinking. After trekking out over the scorched dunes, I found a spot in the sand to paint this shack owned by the late Ray Wells who resided in it until her death at the age of 103. I wanted to capture the scene as it heated up from morning into day. I love how proudly this shack stands, like a lookout over the dune environment. But also this lone black bird near the ocean edge. I stop to admire its oil-black feathers and reptilian demeanor. There is a haunting, almost grim-reaper like quality to its movement and blank stare. I move on. After seeing the black bird I come across a very still seagull. It's enormous with distinct markings that set it apart from the other seagulls that populate the backshore. It doesn't seem alarmed by my presence or skittish in any way so I get as close as I can - which is very close - and take photos. Much later on in the day I return to see the seagull in the same exact spot on the beach, with no other birds anywhere around. It doesn't seem to be able to see me, and its eyes are so dark and shadowed I can't tell if it even has eyes at all. I realize then that its calm behavior means that its probably about to die. I feel strange for greedily photographing it in its final resting place and what I think are probably its final hours. I check the spot the following morning, and sure enough the bird is gone. In everyday life the subject of death is often something easily pushed aside. But today in the dunes these animals remind me of it. And in painting Ray Wells shack I'm reminded of it. I think about what the experience of living in that shack year after year would have been like for her and husband. And because she survived him, how she felt going there for the first time without him. The dune shacks retain the imprint of their owners in a way that newer buildings don't, because they were physically constructed and renovated by the hands of their occupants and then left to face the elements each winter. As an artist drawing them, it becomes very evident that their structural lines often don't follow the rules of perspective. Their roofs slope over time the way an older person's neck or back might. In this way it feels more like painting a portrait of a person than rendering a building. After this long sun-filled day painting in the dunes I feel ready to return home. Not just to my temporary shack home, but my real home. I love being alone out here, but I was reminded today of all the people I love and how temporary our time on this Earth is. Happy Holidays from Michael Lyons Studio ! Happy Holidays from Michael Lyons Studio! Apple-a-Day watercolors close out Edible Rhody's In the Kitchen Issue on their "Last Bite" page! Edible Rhody is part of the "Edible" series, regional quarterly magazines that do an amazing job highlighting local food makers and farmers. Full of original recipes, ideas, and stories, they are an amazing resource for anyone who wants to learn more about their local food scene and be inspired. The sun barely appears through a gauzy layer of fog this morning. The abundant, almost relentless sunshine of the last few days makes this heavy mist feel like an alien presence. I’m slightly disappointed by this unexpected weather; yesterday I worked on a large sketch of Ray Wells’ shack and it was my plan to return today to paint it. I still can, but watercolor subjects are best when there is a lot of sunlight. I wanted to utilize the morning sun here and the way it casts longer and more interesting shadows than at mid-day. Also, when painting en plein air (in the open air), the sunshine speeds up the drying time in between layers which helps prevent colors from bleeding. I take a little longer gathering my supplies in the morning and have a second cup of coffee in hopes that the mist will burn off by the time I hike out to Ray’s Shack. The Outermost House: required reading for dune living. A scene common to dune shack life: staring into the middle distance, minimally dressed, waiting for the sun to return. There is a romantic quality attached to painting en plein air, but the truth is that it can pose some real challenges that inhibit good painting: You have to be prepared for changing weather conditions like rain and wind, and you have to pack wisely – a hat and sunglasses for sunny days as well as mosquito repellant depending on the location. And, if you are working in a public place you must consider the potential for an audience. Robert Cardinal, one of my painting teachers, once said, “If you want to have conversations with people, then paint en plein air, if you want to get a painting done, then work in your studio.” I don’t mind when passerby ask to see what I’m working on; I understand the curiosity. Many will start a conversation about a distant relative who is also a painter, or how their artistic abilities begin and and with stick figures. On one occasion, a man was so excited to point something out in my oil painting that he inadvertently smudged it with his finger. Because the dunes are typically devoid of human beings, this shouldn't be an issue today. As I mentioned in yesterday’s post, Ray Wells was the owner of the shack where she lived with her husband Nicholas. After Nicholas’ death Ray continued to come out to the shack every year until her death in 2011 at the age of 103. In her New York Time’s obituary, Ray was described as an artist, and fighter for social peace and justice. As I hike out to the shack with my large board and bag of painting gear, I imagine what her life was like coming out here all those years and how these primitive shacks have somehow turned their back on time. By the time I reach my painting spot the sun is beginning to peak out. Shadows become visible and then disappear with passing clouds. I position myself in the same spot where I began the drawing yesterday. While the shack is quite a distance away, I can make out that there is someone staying in it. I assume it’s someone out here like I am – doing a writing residency or something. I can’t tell if the person is male or female or if they see me, but I hope I am not freaking them out by being here. Another challenge as an observational artist: trying to reduce one’s creep factor. Since I completed the drawing of the shack yesterday, I immediately get to work on the painting. I begin with the sky and always use a wet-into-wet approach for this step, which means priming the area to be painted with clean water and painting onto wet surface. I mix cerulean paint with a lot of water and use a light touch starting at the horizon where the blue of the sky is at its palest. I then load the brush with more cerulean and the addition of cobalt and go heavier with the paint as I move up the sky. The difficulty here is to know when to stop adding paint and to allow the colors to bleed together and do their thing. I tilt the board so that the paint runs away from the horizon and I use a paper towel to blot any excess and create the effect of clouds. I stop and make a point to not fuss with this part of the painting until the paper is bone dry. Overworking is one of the main challenges in painting with watercolor. There is a temptation to control and model things the way you can with oil paints, but the beauty of watercolor is in the medium’s spontaneity. A good watercolor reflects moments of spontaneity and surprises -- like a party on paper. I get back to the painting and remind myself that I don’t want to spend more than 3 hours on it, even though it’s a large piece – in order to keep things fresh. The sort of crouched position I’ve taken in the sand felt more comfortable an hour and a half ago when I started working. I continue observing the light and color of the scene. Sand dunes can be challenging to draw or paint because they have such soft angles. I observe that the sand road in the foreground is a warmer and more saturated tone than the bright, sun-bleached dune peaks. This painting is a good exercise for me – I’m forced to really look at what’s before me and compare values and color in a way that would be a more autopilot-like behavior back in my studio where I’d have a photo reference to work from. It’s a fun challenge to try and capture the cold, blue-purple of the shadows and their juxtaposition against the chartreuse illumination of the dune grass plants that casts them. I reach a point where I start going back into the painting to fuss and make unnecessary changes, and this is when I know its time to stop and pack up. I leave the painting to dry for a few minutes and take pictures of Ray’s shack so I can work on some more paintings when I get back to my studio. I realize that of all the shacks I’ve seen so far this one is by far my favorite with its positioning high up on stilts and its front wall of windows. I think about being a child and playing the ridiculous game “M.A.S.H.,” which stands for Mansion, Apartment, Shack, House and consists of naming the different lovers you might end up with, the number of kids you might have, and other future outcomes using a using a folded piece of paper as fortune teller. Back then ending up with “shack” was the ultimate embarrassment, but now I can only think about how embarrassing it would be to actually own a many-roomed mansion on the beach. How does one occupant justify all that space? And how would you not feel guilty when it goes unlived in for large parts of the year? There are so many people who have no such view, opportunity, or access. At that moment I realize how grateful I am to the people who built these shacks and were in some cases forced out of them by the government so that random people like me could inhabit them for a week and do their art. Pre-sunrise wake-up. Success. I make myself a pour-over coffee and fill a thermos and grab my cameras and tripod for a morning hike through the dunes. As I walk, I realize how fully in sync I feel with this place. I walk along the beach and revisit the seal sandbar before climbing the hill of the beach’s crest and begin meandering through the dunes. I come upon new shacks I’ve never seen before. Their roofs pop up in the distance and I approach cautiously with my camera, not wanting to disturb any inhabitants. But, I don’t come across anyone. In fact, I haven’t seen or spoken to anyone today or heard the television, the news, or looked at a glowing screen. But, I don’t feel like I’m missing anything, and in fact, I feel quite the opposite. It’s a feeling of being fully present in the moment in the world. I didn’t identify this feeling immediately. It felt like a foreign thing – this lack of anxiety. Like someone pulled a string releasing the knot I didn’t realize I had in my head and heart. And yet it took several days of being in this incredible place to even approach this feeling. Why is this? Another resolution: when I return to my regular life I am going to spend more time alone in nature whenever possible, and I’m going to do it even if I don’t feel compelled to - a mandatory reprogramming exile. You can’t always realize what you are missing in day-to-day life. This experience has taught me that from time to time you need to leave your life in order to find it again. I think nature is the place to do this, and I know now that being alone in this process is essential. The first crack of red light in the morning. No electricity means the pour-over method for morning coffee. Coffee, and everything, tastes better here. 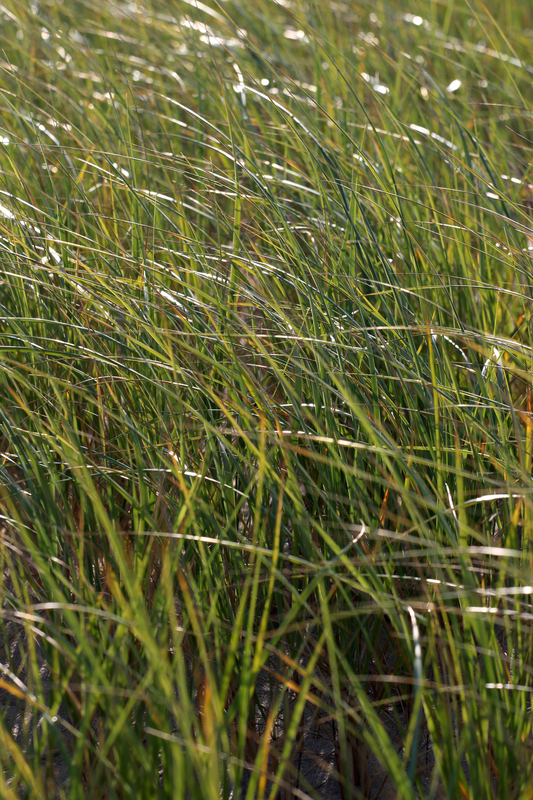 Other shacks appear like this, peaking over the dune grass. They remind me of Smurf Houses. Still learning to use this new camera...where was that timer function again? A dune hike means encountering random surprises like this one. A miniature dune world within the tire treads of the sand roadways. Gorgeous shack I've never seen before. Huge porch and tons of windows. I make a note to paint this before I leave. A wide shot. I later find out this shack was owned by a woman named Ray Wells who came out here every year until her recent death at the age of 105. Even though its only late morning the day is heating up quickly. Another shack along the way...this one boarded up and not in use at the moment. So much festivity for a shack with no apparent occupant. Annabelle! My thoughts, while alone on this trek, immediately go to the 2014 supernatural horror film of the same name. Good thing its daytime. Rose hips. Their red stands out against the otherwise cool dune palette. After a long day of hiking the Fowler shack is a comforting place to come home to. The sky today is that vibrating blue that seems to come toward you rather than recede. It’s the type of blue sky that only happens in September. The temperature though feels more like mid August than mid September. I ask nearby dune dweller, Peter Clemons, if this is normal and he assures me there is no such thing as normal weather in this environment. I haven’t had to use the wood-burning stove once. Most nights I don’t even sleep with a sheet. This afternoon I make use of the outdoor shower (see picture). This system consists of a large, blue, plastic drum that sits on the roof of the “garage” of the shack where it collects rainwater from the gutter. Attached to its base is a hose that snakes down the slope of the roof where the sun’s rays warm it to the point of being almost scalding on a sunny day. The shower feels fantastic, and its phenomenal to be free of sand even though I know this sand-free state will only be a fleeting one. In a past life I worked in New York City designing rugs for the Stephanie Odegard Collection. The philosophy there was that rugs were akin to paintings for the floor. Since arriving here I’ve been seeing inspiration for rug designs everywhere. 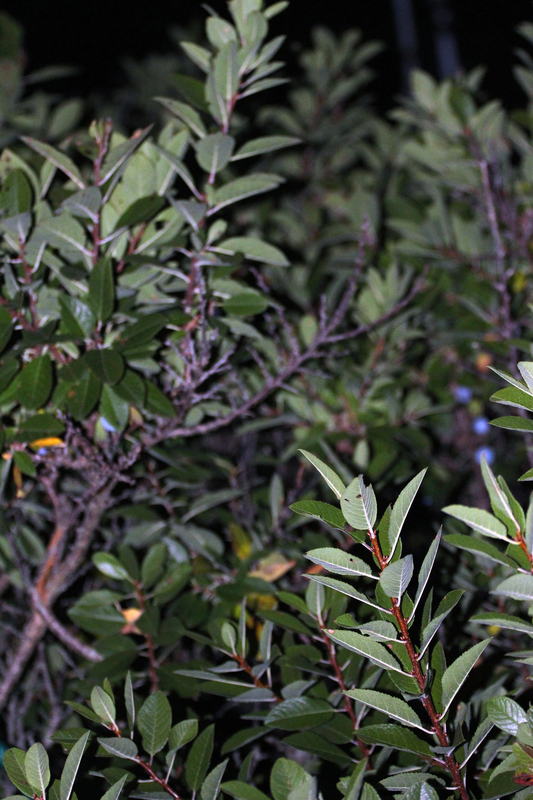 There is a scrubby, ground-covering plant that is the most beautiful milky jade color. It appears almost like a carpet on top of the sand floor surrounding the shack and it takes on so many different colors throughout the shifting light of the day. There is so much color to observe here, and I spend many minutes of the day just staring at the blue shadows the dunes cast. The shadows are not gray or black or dusky in any way. They are a strong and solid blue, and like the sky, they vibrate. I spend the afternoon painting. I’ve begun an oil painting based on the watercolor studies I did yesterday of the boat on the bay. 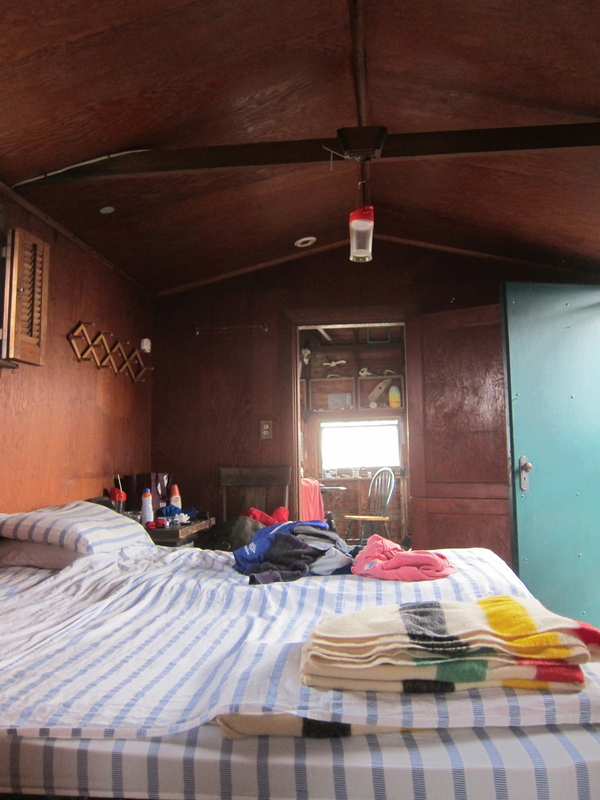 My attention though is diverted at times by the urge to photograph my surroundings and the interior of the shack. Today is the first day that I was able to watch both the sunrise and sunset from the high dune behind the shack. Its startling to me when I realize I’ve never done both these things in the same day before in all the years I’ve been on this Earth. I resolve to do it more and to start waking up earlier when I return to my real life. This is not the first resolution I make here, and I know it won’t be the last. 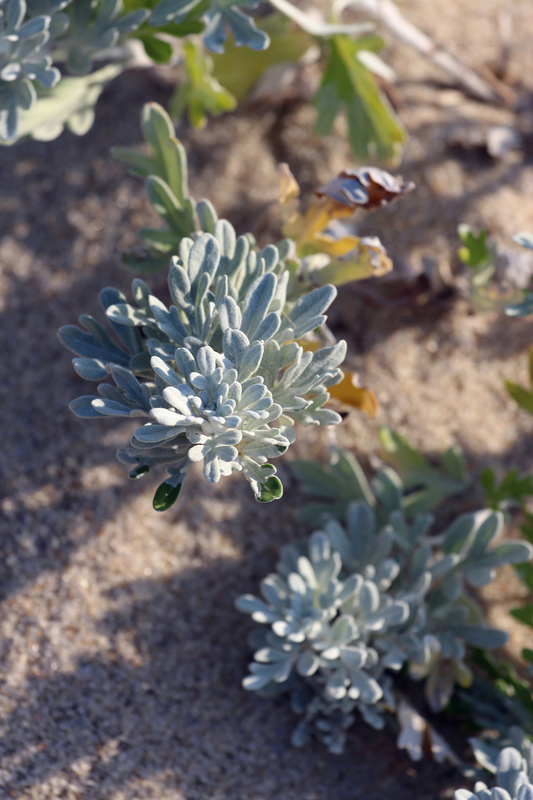 current obsession: the aforementioned scrubby milky jade green dune carpet plant. View of the back of the shack and the solar shower system. scrubby carpet plant is now the color of Baskin Robbins mint chocolate chip ice cream. I wake up at 6:22 this morning. The orange light filling the shack tells me the alarm I set didn’t go off, and I missed the sunrise again this morning. Need to remedy this for tomorrow. I pull some clothing on and trek down and over the hill to the ocean and walk along the beach for ¼ mile until I see the incredible sandbar Chip had alerted me to. Hundreds, probably close to a thousand, gray seals have taken residence on a recently formed sandbar. I spend some time watching them and take a ton of photos (see below). The seals are a source of some controversy. The conservation effort to protect the species has worked well, so well in fact that it their increased population may be responsible for the increased sightings of Great White Sharks in the area. I am not overly concerned about the sharks, but I’ll only get in the water when I don’t see any seals - as everyone seems to advise. The seals though are a welcome sight during this stay. They provide a source of entertainment and I love seeing how varied they are in their size, age, and colorations. This afternoon was devoted to painting on the porch studio. I’m working on a continuation of the “beached boats” series I’ve been focusing on for the last seven months. I tell myself I will take some time to paint the local scenery, but for now I’m using my uninterrupted time here to continue this investigation of the boats on the bay at low tide. The boats are mostly utility and sailing dinghies - a common sight in the Provincetown Harbor. At low tide, they mark the beach tethered in place by their anchors. Their garish paint jobs, when lit by the famous Cape Cod light, become transcendent. Describing one’s work is a challenge for any creative person, or any person for that matter. My boyfriend John says that at cocktail parties or other situations it is our responsibility to figure out a way to talk about what we do in a way that is at least somewhat interesting and inclusive and that allows for the potential for more conversation and follow up questions. Even if you don’t like your job and dread talking about it, or you consider it boring or too obscure to discuss with a layman, he says you must do this for the sake of conversation and the greater good of the party. 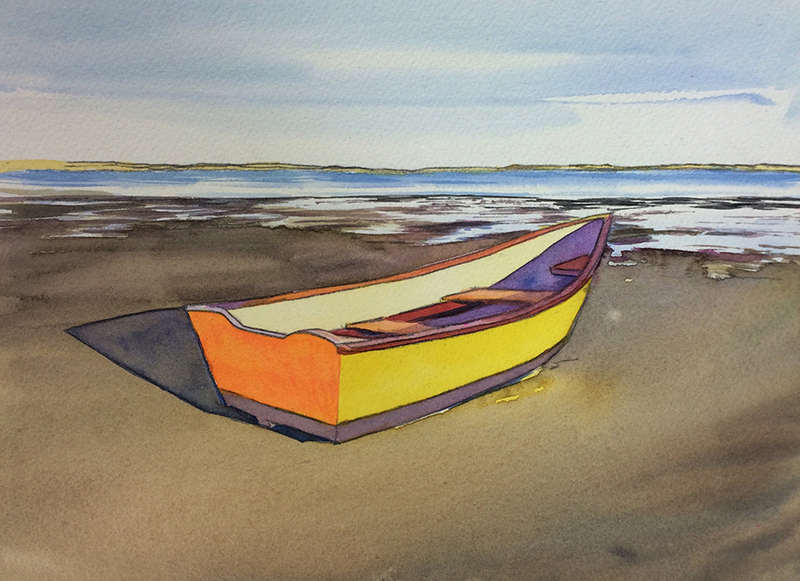 So, in describing my work I can tell you that my decision to start painting boats came because I was looking for a change from painting the male figure, which I had been doing for the past three years. I like to think that the unifying element in all of my work is a concentration on the sense of light hitting a subject. I don’t think of it so much as a painting of a person or a boat or a house or an apple. My focus is on painting the way the light is hitting the person, the temperature of the light hitting the boat, the quality of the light hitting the house, or the feeling of the light hitting the apple. I fear this might be sounding a little Thomas Kinkadeian, but really what I’m trying to say is that for me the subject can at times be inconsequential to the meaning of the work, what I’m really trying to showcase, and where my interest lies, is the presence of light in our natural world and the way it illuminates the beautiful, but also, the ordinary. Seals for days. The ones in the foreground are the best. When together like this the seals emit an extremely load collective groaning sound that is akin to something you'd hear in a Halloween Shop. If they weren't so adorable it would be haunting. There are quite a few seal pups and some very seasoned looking seals among the group. Distinct personalities shine through. All that seal photography was exhausting. A little palette wrangling over coffee. I start some watercolor studies for a larger oil painting I'm considering. Here I'm working out some different colors. I start by using mixed complimentary colors only - in this case orange and blue. Here I've combined aspects from the previous two palettes to create a fuller range of color. Oh. That Cape Cod light. Hard to resist photographing everything all the time. The Margo Gelb Shack hugging the horizon in the distance. A wide shot of the Margo Gelb shack. The reaction I receive when describing my stay in the dunes to people typically goes one of two ways. Their eyes get wide and they say, "That sounds amazing! How peaceful!," or their eyes get wide and they say "You are crazy. Why would a person want to do something like that?" While I've never actually gone camping, I know it must be far more rustic than this. At least the shack has floors, walls, and a ceiling to give protection from the wilderness. The latter reaction, I think, may have more to do with the idea of being isolated at night within a physical structure without electricity. For instance, about a month ago I found myself re-watching the movie Silence of the Lambs. I knew this was foolish considering how fresh it would be in my memory during the shack stay, but I didn’t realize just how foolish until the sun went down and an uncanny resemblance between the aesthetic of the Fowler shack and the interior of the home of Buffalo Bill emerged. To conquer any growing fears I light every single lantern in the shack, pour myself a strong drink, and crank the transistor radio. If all else fails I remember that my father, in an upgrade over the baseball bat he gave me for my 2010 stay, has bestowed me with an ax. There are a lot of hikers in the dunes. Many of the shacks feature signs like this to keep any curious eyes at a respectful distance. I immediately strew my clothes on the bed to make myself feel at home. no shortage of charm or nautical references. The narrow, screened-in porch is my makeshift art studio. The Pilgrim Monument on the horizon is one of the few reminders of town and life outside the dunes. Once the sun sets, night consumes the dunes so quickly. 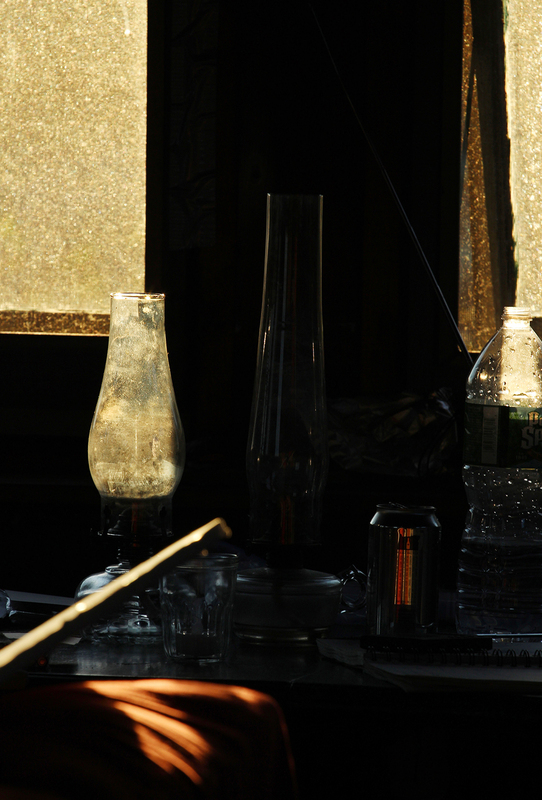 I find myself hurrying to re-fill the glass oil lamps while I still have the half-light. To pass the time I experiment with the timer on my camera for maximum horror effect. I've forgotten what the real darkness of night feels like. 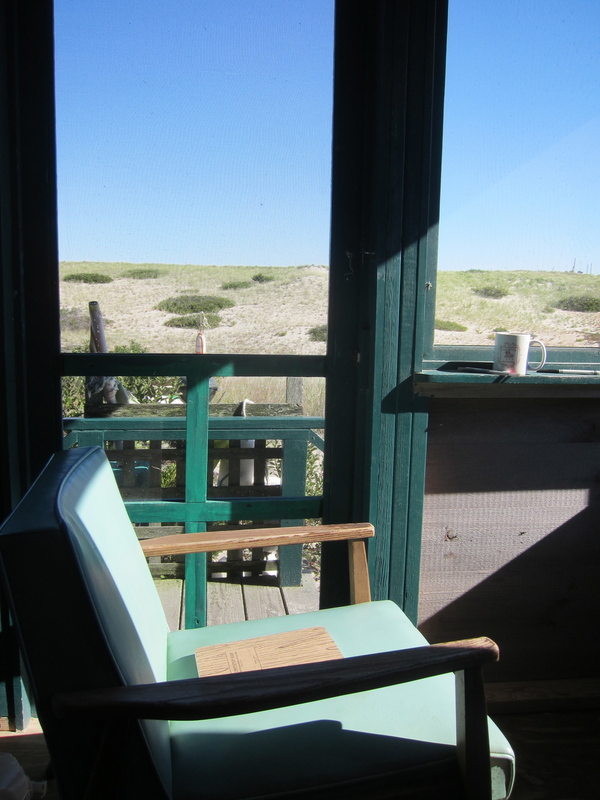 I write this on my first morning back in the Fowler Dune Shack. My last time here was in 2010. I’m five years older now, and so is this rustic, one-story, three-room, side-gabled, wood pier supported structure, set amidst the seemingly endless sand dunes of Provincetown’s backshore. It’s what I’ll call home for the next week. Alone. "The primitive nature of the structure - no electricity, indoor plumbing, or telephone - and its physical isolation allow for uninterrupted solitude and refuge." I'm hoping that's what I'll find here. This blog will serve as a record of my stay and a companion while I'm here on my own. Stay tuned for more photos, writing, and art. Good view of the Fowler Shack in all its glory. To the left of the shack is the makeshift sand road that Chip used to drive me and my stuff out in his truck. After this memorable New England winter many of the dune roadways had to be re-established. View from inside the screened in porch. Just over the hill is the Atlantic Ocean. John Denver's "Take me Home, Country Roads" playing on repeat in my head. Sandbars diptych, 10" x 29"
I continue to be inspired by the bay at low tide. Here is a new watercolor double-take on a scene I encountered in Provincetown. I loved the "beached" look of these small boats and how majestic their masts look punctuating the sky. Watercolor of a recent home renovation in Chatham, NJ commissioned by its architect. Commissions offer a nice change of pace from my studio work and an exciting challenge. The clients were really happy with the resulting painting, and I had a great time working with them. If you are in New York, you can see two paintings of mine on display from now until January 16th at the historic Salmagundi (47 5th Avenue.) I am a Junior member of the club and this exhibition highlights the work of members under the age of 35. Always a fun show to check out!